Good trunk shows pick good locations. Not necessarily fancy, but convenient and in a space that shows the product in a good light. This is particularly true with ready-made or made-to-measure brands, where customers are more likely to compare them to a physical shop. And it’s something even tailors should try to remember - rather than assuming their reputation is sufficient to pull people to any old room in any old hotel. When Saman Amel visited London for the first time last month, they had clearly thought about the space. The rack of jackets and suits was carefully hung; the sweaters and polos were all precisely folded and presented. It was a nice set up, with light streaming in from both sides of the second-floor space. And in many ways it was a neat metaphor for Saman Amel itself. 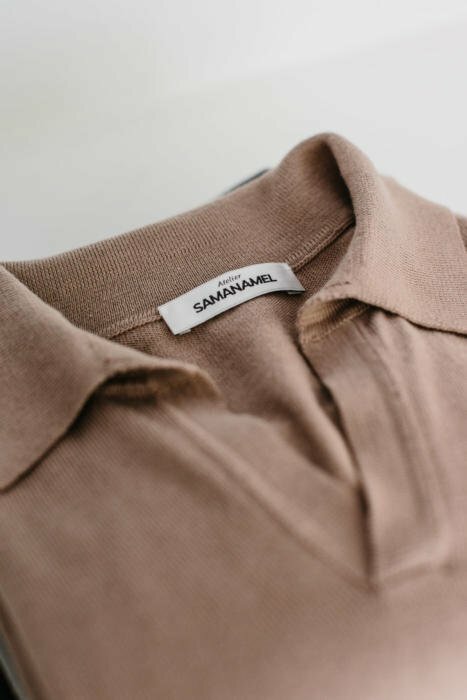 Set up in 2010 by friends Saman Amel and Dag Granath in Stockholm, the brand has developed an enthusiastic local following for its made-to-measure tailoring, ties and knitwear. The aesthetic is simple, muted and refined. You could call it Scandinavian, but that would be to pigeonhole something that, in a digital age, can never be so restricted. Rather, it feels modern. Dressed-up tailoring that isn’t corporate; fine knitwear that isn’t fancy or fussy. Cuts that are pretty traditional (particularly jacket length) but still contemporary in their styling. It isn’t a unique look. But it does seem to be one that is being well-executed - and as of last month, is now available in London for the first time. When I arranged to meet Saman and Dag, I was planning to try the made-to-measure knitwear. I’ve tried a few MTM services for knitwear over the years, and it usually hasn’t worked well (Loro Piana, Simone Abbarchi). I was hoping, therefore, to find somewhere I could regularly order knitwear from, in a tweaked fit. I also liked the styles - such as the tennis sweater (pictured at the bottom of this post). But I became interested in the tailoring too when I realised the top line, ‘Napoli’, has a hand-padded lapel (from £2200, pictured on me above). There are several other points of handwork, but it is the hand padding that sets this Saman Amel line apart from most of the rest of the MTM market. I do not pretend to cover made-to-measure comprehensively, unlike bespoke, but I’m always interested in things that can incorporate aspects of bespoke - such as individual patterns, hand cutting, or hand padding. And if the fit of this Napoli jacket I’m being measured for is good, it is of course a partial recommendation for their cheaper line, ‘Toscana’ (from £1400), which is not hand-padded but has everything good RTW should have (eg hand-attached collar) and hand finishing (eg buttonholes). Dag is wearing the Toscana line, below. When I was fitted, Saman’s approach was impressive. Of course, this doesn’t necessitate a well-fitting garment, but it’s a good start. Saman (below) took about half an hour to measure my body, looking carefully at the slope and pitch of the shoulders, the collarbone, the back shape and posture. And he then took similar measurements on a ready-made garment, with Dag taking notes on his laptop the whole time. This was by some way the most involved measuring session I’ve had for a made-to-measure garment. Saman studied for three years in Sweden in an institute called Tillskärarakademin, which translates as Academy of Cutting. Like many such courses, fashion and design was a big part of it, but there was some extended study of fit and cutting techniques, which Saman initially used to develop dresses that gained him some attention. In his second year he started making his own shirts and tailoring, staying away from high fashion. And in his third year started the project that became Saman Amel. Saman then worked for J.Lindeberg, becoming their head of MTM for Europe. So he has quite a bit of experience with tailoring - but neither he nor the brand refer to themselves as tailors. 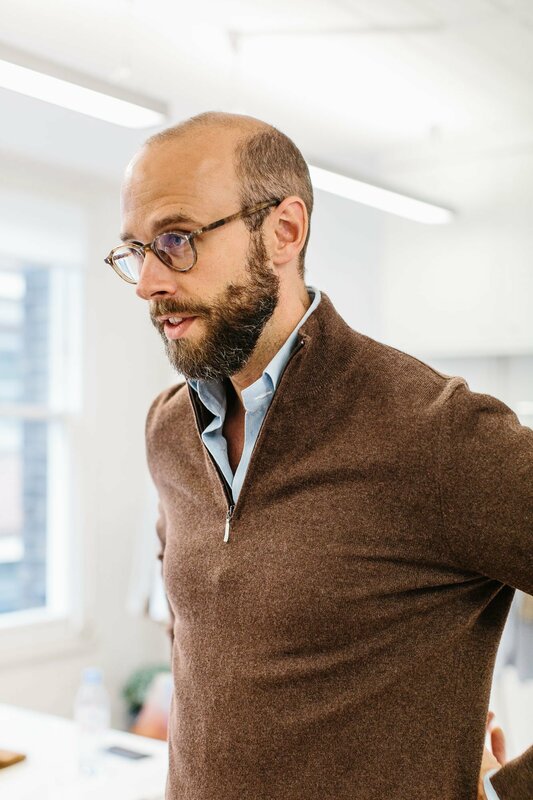 I opted for a brown three-button single-breasted jacket, in Loro Piana Prince-of-Wales-check cashmere, with patch pockets and a welt outbreast pocket. In the knitwear, I went for a half-zip sweater in brown cashmere (above). The Saman Amel ready-to-wear fit is actually pretty good for me in the knitwear, being a little slimmer and a little shorter than most. But we still slimmed it a touch more. You can get an idea of the range of Saman Amel designs on the website, by the way, which sells ready-made knitwear and ties. As with everything else, it’s simple and muted colours: cream, taupe and brown, alongside the classic grey, navy and black. With minimal patterns. I’ll be very interested to see how the jacket and knitwear turn out (Saman and Dag are back in London from November 1-2). I know readers are always keen to have lower-priced tailoring options reviewed; and I know many are equally excited about brands that combine classic ideas of fit with modern, younger styling. It is that style that separates Saman and Dag from the cheaper bespoke tailors, by the way. And as I’ve said so frequently, style is something bespoke tailors underestimate at their peril. More images from the Saman Amel lookbooks available on their website, here. You can follow the discussion on Saman Amel – Classic tailoring with a modern aesthetic by entering your email address in the box below. You will then receive an email every time a new comment is added. These will also contain a link to a page where you can stop the alerts, and remove all of your related data from the site. You mention you weren’t entirely satisfied with Knitwear from LP an SA. May I ask why? I tend to buy knitewear at cheap places like Boggi or SuitSupply, because they A. fit me fine and B. are about a quarter of the price of what I’d pay elsewhere. I rather spend that Money on one Bespoke Sportcoat more per year, or a pair of Saint Crispins. 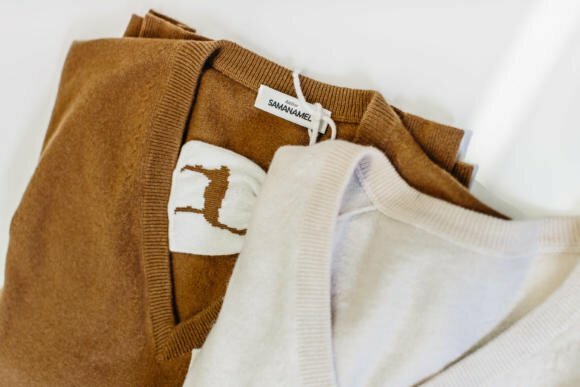 On Loro Piana: First sweater we made was bigger rather than slimmer. A pretty poor fit. Second was perfect. Obviously very expensive too. On Simone Abbarchi: Made one sweater, rather too slim and short. Just about wearable, but not great. 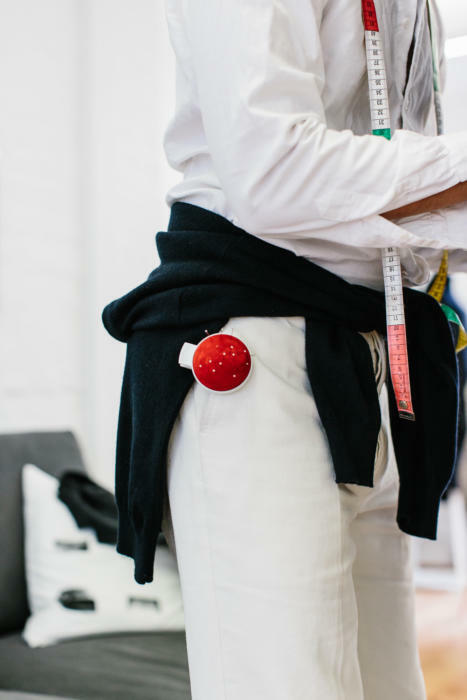 They aren’t actively offering it anymore at trunk shows, as they found it hard to get patterns right with the manufacturer. On RTW, I completely understand. If you can find a good fit, that’s great. 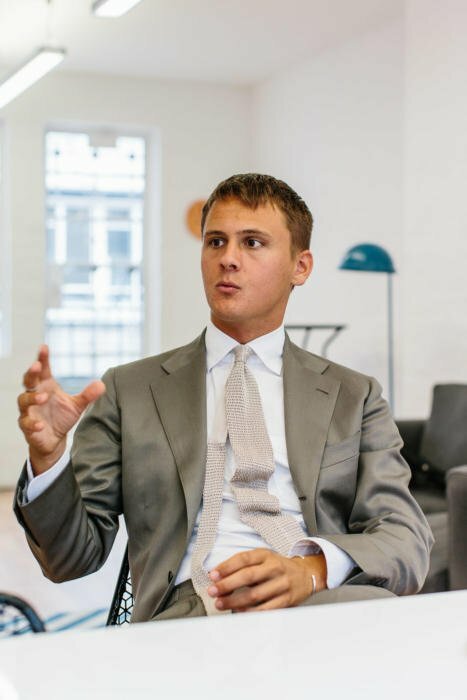 If you are considering trading up, do look at Luca Faloni. Top quality, lower price. Been following them for quite some time on instagram, impressive. Will try to pay them a visit this autumn. Finally! I have only heard good things about them. Simon – In the second photo of you with Saman, your collar caught my eye. It’s so well proportioned and stands perfectly. What can you tell of the shirt and specifically, how you directed the tailor when it came to the collar? It’s the button-down collar I developed with Luca Avitabile in my bespoke shirts. Essentially the button is moved up slightly to make the collar roll outwards more, around the collar of a jacket but also around a tie. Given some of this is MTM the prices will still be north of what many of us can afford. Is there much good MTM at below £1000 prices ? Maybe that’s the challenge for you now ? Suits are expensive, but there is no way to get around the money required to get good quality. Hi Simon, any appetite for covering more Spanish tailoring? I only ask as I know that Camiseria Burgos & Lopez Aragon do MTM jackets at well under £1,000. I had a hopsack Teba made up by LA earlier this summer for about €360 and it’s just perfect to throw on with chinos and a button-down collar shirt in the summer. I have covered Burgos, Langa, Reillo and Calvo de Mora, though not Lopez Aragon. There are reviews on the site if you search. I would take one step up and try the business line from Saman Amel. The number of available cloth are limited but you can always find a mid-weight navy or grey. It might be useful to look at other blogs that review lower price MTM. The Modest Man (US based) has reviewed some MTM companies. The made to measure knitwear sounds very promising; I will be very interested to hear your views when the full review arrives. 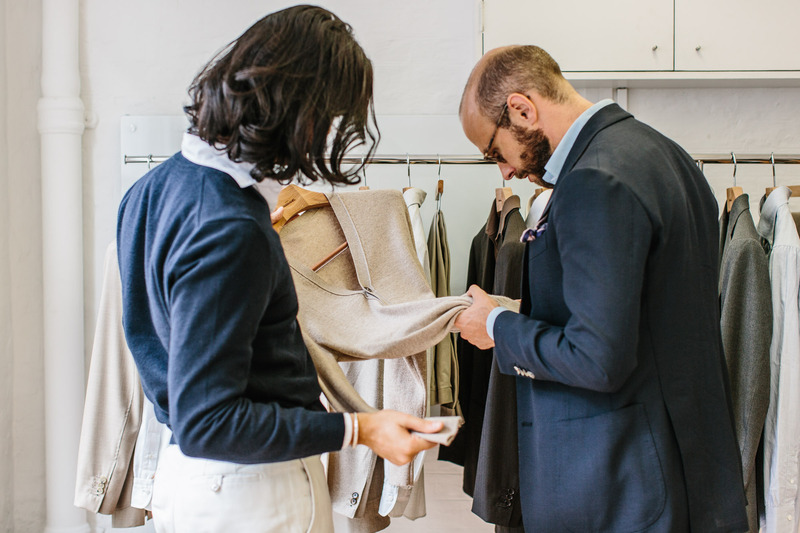 Any (initial) thoughts on how the quality of the cashmere compares to, say, Luca Faloni? Do Saman Amel also offer knitwear pieces in wool? Not currently, no, but there were cotton options for summer. I have the half zip model you’re trying on in lambswool, picked it up last fall along with a navy overcoat. Very happy with both, will certainly return for more. I hope they will return with wool offerings again, it’s easily the best and most luxurious wool offering I’ve tried. They even took it in after some change in weight and it came back looking brand new. Being shy of 2 meters tall with long arms, MTM knitwear is gold. I have a few shirts, suits and knits from these guys and they are always spot on. Style is subtle yet striking and fittings are conducted really carefully and with an attention to detail unlike any other makers i’ve tried. Looking forward to having more stuff made! Good to hear. I was wondering if the care shown in Simon’s fitting was due to his reputation and the prominence of Permanent Style. Good to know similar care is shown for us less prominent types! Apologises for adding to the inevitable (and probably tiresome) comments proposing other cheaper options that appear on any piece you write about makers at the lower end of your spectrum; I’m wondering if you have managed to lend your eye to Trunk’s own brand MTM? As I understand it their entry-level offer is made in Italy from Ariston wools – starting at £900 for a 2-piece or £700 for a jacket with Loro Piana or Fox Brothers about £300 more. I’m wondering if you think this is a sensible place for a (relatively) recent graduate to pick up 3-4 business suits over the course of a year, if willing to accept a reduction in quality from an entry level bespoke option in order to access the higher level of style/design of MTM. If not, what would be your recommendation around the £800-£1,200 mark? You’re right, I haven’t tried it so can’t really comment on the fit etc, but the price certainly looks reasonable. Simon, I thought you’d recommended Whitcomb & Shaftesbury before and they’re at that price point aren’t they? Well, I can’t make any judgment on Saman Amel having not had a finished garment. (There’s a reason I write overview pieces and then, sometime later, proper reviews). And I wouldn’t necessarily say I prefer well-designed MTM or fairly standard cheap bespoke. I tend towards bespoke generally, but the point is that I know many readers will want the design element, and I want to present the advantages of both. Within the same price range (starting price of about £1700), I recommend Henry Herbert for full bespoke. If you look outside London, I’m sure you will find a few bespoke tailors who fit your budget. I am not a rich man, so I understand everyone’s concerns here. The way to do it is to skimp on unnecessary expenses and focus on the essentials: your suit should fit, and the material should be high quality. Until you are financially comfortable, you can skimp on the things that don’t really matter: underwear, watches, sunglasses, even shirts (since the only bits that are seen are the cuffs and collar). And save money by staying away from pubs and expensive restaurants. If there’s one thing you should skimp on it’s food (now there’s ephemeral investment if ever I saw one). Thanks. I have not used Henry Herbert for many years, but he was one of the first people to receive a poor review on Permanent Style. It wasn’t a great fit and it wasn’t bespoke. Thanks Simon for your quick reply to my previous comment (and also all the work you do on this invaluable blog, which I forgot to thank you for previously). 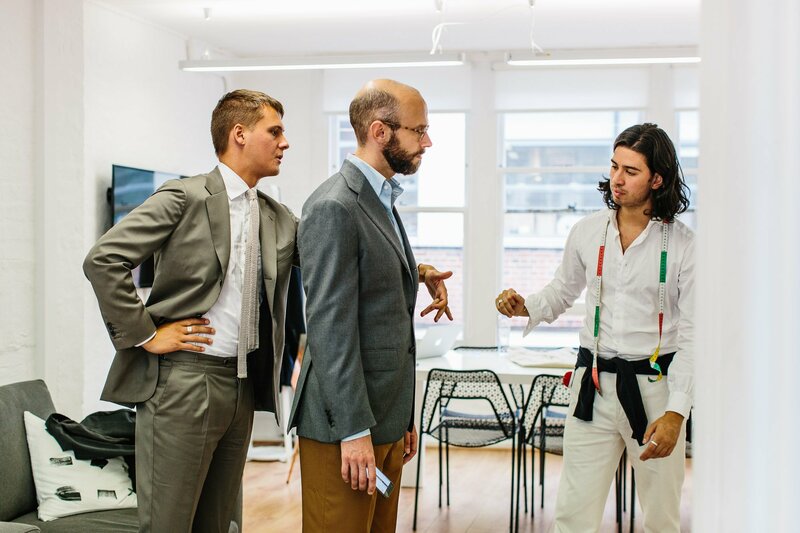 Just to follow up, do you think it would be better to be buying 2-3 suits from Thom Sweeney / Saman Amel / Eidos over the course of a year, or 3-4 from Trunk over the same period – if trying to quickly build a working wardrobe broadly from scratch over that time? I have two Gieves RTW suits which are falling apart a little, have to wear a suit every day, and am rapidly having to spend more time with clients. PS. Did you omit P. Johnson because the style isn’t suitable for business or because you wouldn’t recommend them? PPS. If it helps other readers trying to understand why reason I’m not looking at bespoke, its because I am after something suitably modern for someone in their mid-20s (although suitably classic for facing clients decades older, not skinny high-street lapels or chest-high Suitsupply buttoning points). 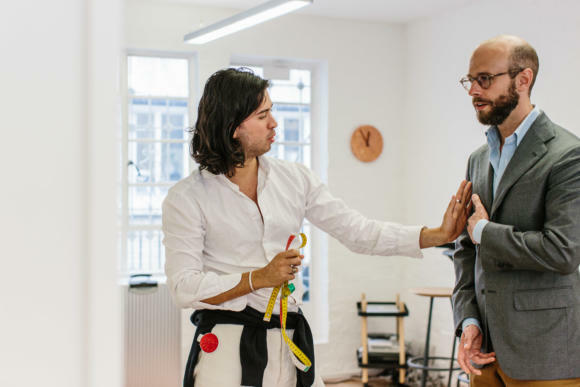 There are a number of bespoke tailors Simon has mentioned on this site who can cut such suits (Rubinacci, Thom Sweeney, Gieves, Cifonelli, Liverano etc). There are also a number of bespoke tailors who I could sensibly afford (Whitcomb & Shaftesbury, Graham Browne, Manning & Manning etc). Unfortunately there is no overlap between the two, hence my personal preference for the modern design aesthetic of mid-level MTM over the craft of entry level bespoke. I’d probably go with the first of your two options. P Johnson is a whole other conversation, but their style is also generally younger and shorter. Thanks very much again, apologises for the mini-essay by the way. Will take a second look at Whitcomb & Shaftesbury. Interesting. Can’t say I’ve had the same experience. Was this a long time ago? I can’t find the review. I’ve been a customer for years, and I have a suit, a few pairs of trousers and some knitwear. I highly recommend their products. Simon – in the final photo of the three of you, is that jacket not far too short for you? Was it merely to demonstrate the style of the jacket? Egad! I must’ve been seeing things, Simon. I was pretty convinced that was your herringbone cashmere from F Caraceni. It’s not as prominent as before, but a sizeable chunk of the curiosity regarding your posts is centered on what you wore when the photos were taken. As a tangent to that, you’ve also shared instances when your hosts commented on the craftsmanship put into your outfit. Any such remarks from Saman and Dag for what you wore during the fitting? Oh, and I was wearing my Ettore de Cesare navy blazer on top, in Holland & Sherry mesh. I think it was a big strong for the trousers though. Pale grey might have been better. Agreed, I do see what you mean about the jacket-trouser combination. That, or something about the trousers seems too saturated for the navy. I rather admire the equal opportunity you provide for new and old pieces to be worn. Simon, I am a little confused. Your reports on W&S were by and large very positive yet you suggested that your end of piece comments on bespoke tailors underestimating style at their peril was aimed largely at them and tailors like them. Could you possibly expand on that please? It’s a very big question, and perhaps one that needs it’s own post, but generally it’s about value attributed to craft and to design. Both are highly valuable. You can’t do without either. The nice thing about tailoring is, it involves very little design. There are very few variables to an SB navy suit, and so tailors do with thinking much about design. 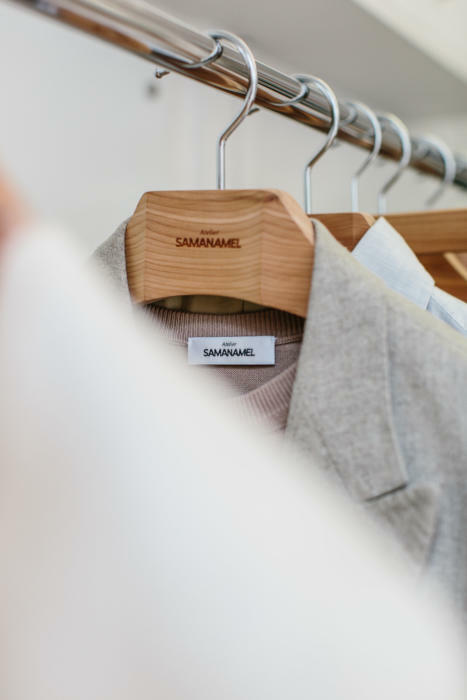 But when you want something else – a coat of a particular design, a jacket that works well with jeans, a colour palette that feels modern but still smart enough for your office, then design becomes increasingly important. And a tailor who has never made something like that before, has very little knowledge of all the things he could make, and has neither time nor budget to spend lots of time prototyping, is often not best placed to produce it. This is why we (or at least I) spend some time seeking out tailors that already produce these things. Design and craft are both important, and with someone like Saman Amel you get a big dollop of modern design and style, without bespoke craft. I would happily have them pick out an entire wardrobe for me. I can’t think of a single tailor I’d entrust that with. If youre not looking for bespoke craftsmanship, then you have a free hand. Then its about what looks good, suits youre need for the item/ensemble, wears well and makes you feel comfortable. Then you are free to buy at any price point, and any sense that it has to be a certain price to be OK is misplaced. Craftsmanship is not binary, I’m afraid. As laid out in this post: bespoke, to hand-padded MTM, to regular MTM, and then to things people are looking for under £1k. It’s a sliding scale. You are not free to buy at any price point if you give up on bespoke. There is craft at every level, in everything from cloth to structure to finishing. In fact, interestingly that craftsmanship is often fairly closely tied to cost, where design isn’t necessarily and is therefore much harder to justify in the final price. I’m not a difficult fit particularly, but I still find very little knitwear I like the fit of – I’m a little fussy about it, as you’d expect. Luca is a great fit for me, as I’ve talked about previously. But his styles and colours are limited compared to MTM – he doesn’t do a half-zip for instance. I was just thinking of this. Simon – please use all of your influence to emplore Luca to do a half-zip. I absolutely love both a half-zip with a shirt and Luca’s work, so this would make me a very very happy customer. So out of interest, with a RTW Thom Sweeney suit (as an example) being circa £1300 plus the cost of alterations, what’s the advantage of spending your money there over and above Saman Amel or W&S? 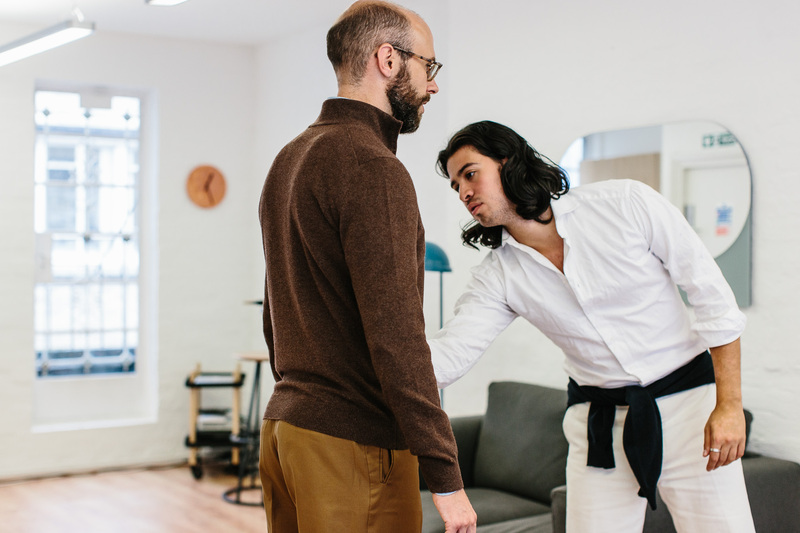 As a slightly separate but linked point would you say that in clothing and footwear it’s harder to discern what is good value and what isn’t, compared to other areas of life, with there being so many related points, i.e. craftsmanship, style, design etc. etc and at the end of the day it more often than not comes down to opinion as opposed to fact? i.e. you feel that the extra money in getting fit just right justifies the cost of MTM knitwear, whereas most others on here seem not to, and instead choose to spend their money on other items where bespoke/MTM makes a more noticeable impact? As a fairly new reader, I have found this to be such an informative website, so thank you for your work. 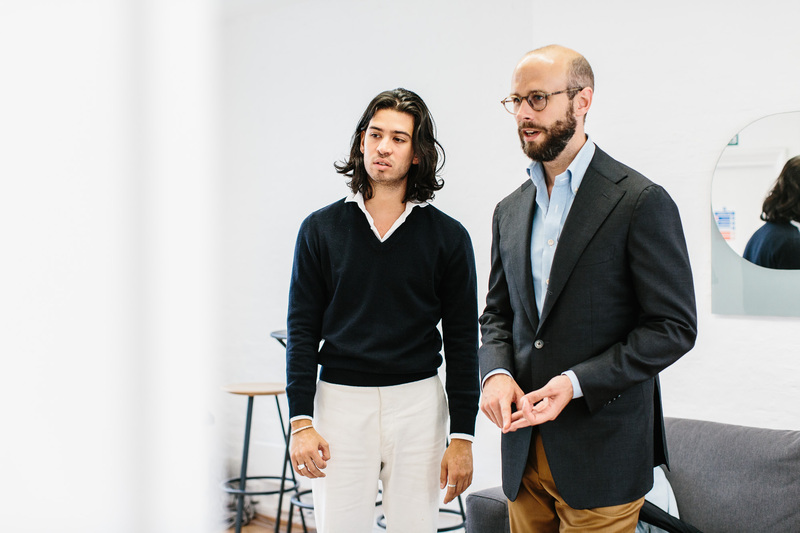 Thom Sweeney is an interesting example, as they are one of the few brands that sit between both good RTW and bespoke. Essentially with the RTW there you are paying a decent amount for design, plus the convenience and experience of having shops you can go into any time. Running a visiting service like Saman Amel is a lot cheaper. I would actually say that in clothing and footwear there are two clear halves: craft and design, and craft is very easy to judge the value of, while design is very hard to judge the value of. Most other things fall somewhere in between those two extremes. Now, once you have established what the value is in something (like MTM knitwear) it’s up to you whether you want to buy into that value at all, whether you want it yourself, personally. But it is easy to see objectively what the benefits are. Thanks for clarifying. So in terms of fit, the latter two would presumably be preferable, assuming you are willing to wait for the end product. Trying to plan a first foray in to MTM/bespoke as an upgrade from RTW as I tend to wear a suit every day for work. The value for me in upgrading is clearly fit, as I assume there is very little difference in the quality of fabric in good RTW vs MTM or bespoke. The difference in the make meaning that something bespoke should last/look better for longer? I think my question largely echo’s what ‘H’ is asking, albeit I’m probably moving towards W&S as I think I’ll get better use out of it over a longer period of time, and am happy with slowly improving my RTW wardrobe. If only I could avoid the lure of the Mr Porter sale, saving up would be easier! I commissioned a tan cotton suit (similar to your Elia Caliendo) from their Napoli line earlier this year and I’ve got to say that it’s one of the best fits I’ve experienced. Not cheap but in terms of craftsmanship it’s definitely a great value. I just ordered my second piece which will be a tweed sports coat for fall. BTW, the first time I read that I thought it said tweed shorts for fall. Never mind. Most of my cashmere sweaters are from either N Peal or John Smedley: are these models of a similar quality, or even better? N Peal will be better than Smedley in most cases, and Saman Amel on a par with Peal, roughly. 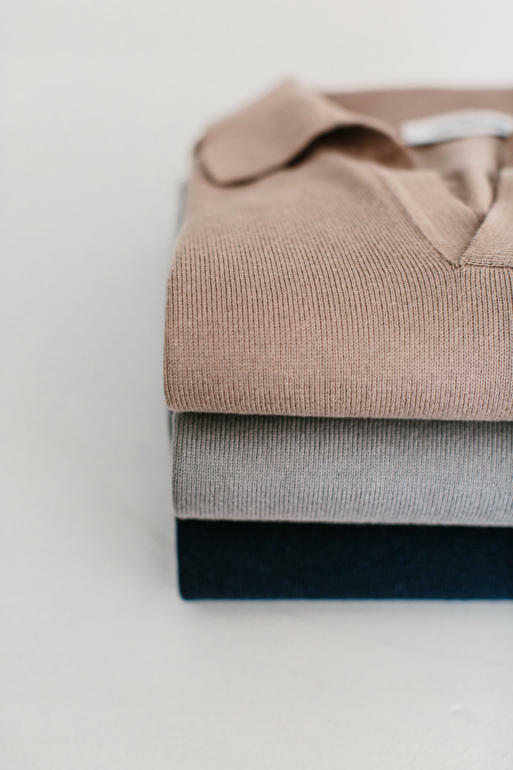 Lockie or Johnston cashmere will easily be a match for quality, but will be much less expensive. Unless fit is an issue, why would you even think about spending more? It’s entirely a fit issue. Lockie is easily some of the best quality cashmere I have ever owned But as Simon points out fit is an issue. I am quote “boxy” in body shape and even then they are so big and baggy despite sizing down. Scottish Knitwear Problems. I have to by Lockie Garments which are private label to others where the sizing has been modified slightly… or buy Luca Faloni Instead. Simon, your sartorial guidance please. When wearing a sweater, should I let the collar points stick over the top of the neck, or stay inside it? I never can be sure. Both Saman and Dag have such a clean aesthetic and great vision. The execution is actually brilliant. Very elegant and the simplicity is beautiful. Aside from that both are solid gentlemen. So glad you were able to cover them, excited to see what they make you. 2) Communication, planning, and delivery is always on time, as a service they are very reliable on all fronts. 3) Their approach focuses on the product (always), but they are also great people to talk to in general. While you are looking for garments not friends, I found to be contributing a lot why the product matches the expectations and future commissions. I have now 3 suits (Toscana line), 1 pair of seersucker trousers, their older popovers (3), and, which I would highlight: one tie and one outerwear piece. Along the suits, I would emphasize their outerwear offering as well. I am really impressed by Saman and Dag. I have bought a couple of suits, sport coats (all in Napoli line), some shirts, odd trousers, a cashmere overcoat and some other stuff. And I think its good value. The only “better” things I´ve tried is a full-bespoke suit from AW Bauer and a MTM suit from Cesare Attolini. But they are in a totally different price bracket. I have tried “cheap” bespoke (Graham Browne) and consider Saman Amel Napoli the equal in fit and superior in style and handiwork. But of course you have more options in bespoke. It´s also obvious that Saman has become more experienced during the years. My first chinos and shirt were not as good in fit as the later items I have commissioned. Thanks Carl, interesting to hear. Well Simon, I am not sure where where I would raise this. It is a “style” that seems to be growing. That is, a personal “uniform” a la Steve Jobs. Since most people are going to mess it up anyway, why not choose a uniform and get the choice out of the way? In a run – on train of thought, we have all been seeing too much Kim Jong Un lately, but I have to admit, there is something interesting in those suits he wears. The jacket is a style type all its’ own, not Mao, nor Nehru. It certainly eliminates the need for a shirt choice, and is definitely several notches up from the track suits favoured by Eastern European gangsters. Simon, do you have a view on v-neck vs crew-neck knitwear? Is it ok to wear a shirt with both? Thanks Simon. Sorry, another style question: what colour chinos would you recommend with a navy hopsack blazer? 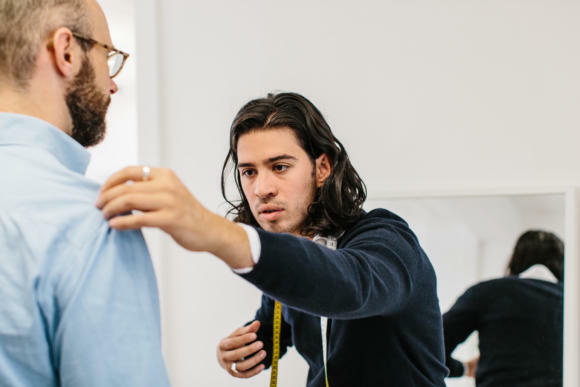 “style is something bespoke tailors underestimate at their peril.” well put Simon, most tailors only consider the good fit and ignore or even look down on style. On the other hand I am guessing that only a minority of clients of E Sexton, Cifonelli and other tailors with a distinctive style will actually go for their style and not for something very ordinary. Not everyone dare to wear the styles they like on pictures. This notion, so often repeated in these reviews, baffles me. Surely if a man knows his own mind, and has a fairly good idea of the style that flatters him, and asks his bespoke tailor for exactly that, and if the tailor knows his trade, then surely the finished article will have style? I’m genuinely trying to understand the philosophy here. I’m the kind of man that likes to fade into the background. I’m the exact opposite of a Pitti Uomo peacock. And I’m neither attractive nor well-proportioned. So I’m not looking for any cutting-edge style. I’m just looking for clothes that fit me, that give me a little gravitas on the workplace, and a suitably noble bearing elsewhere. If I went to Cifonelli I’d have to get him to completely forgo his house style, because those signature lapels would make me stand out, and wouldn’t look good on a short bloke like me. So what would be the point? It is interesting. It seems you are classic to the point that style may do nothing good for you. Nothing wrong with that nor classic. But style is not necessarily extreme as may be the case of the pitti guys, or exagerrated tailor shoulders. I think a windsor cut by Tom Ford has enormous style. I think knowing your style and telling your tailor to do it often proves frustrating. From the mental image of it in your head to what the tailor will understand and eventually make there will always be a significant gap. And unless you are a stylist yourself or spend dozens our hours defining/drawing your ideal style (which I did), a tailor will most likely not succeed in fulfilling your desire. Even when I brought a jacket and asked the tailor to replicate it, it was not always satisfactory. My explanation is that style depends on minimal changes in dimensions, volume in complex areas like the lapel, shoulder head and shoulder line. Now whenever I go to a tailor I come up with precise drawings, close ups, and a lot of talks. Agreed, one ought to take into account the proportions of the wearer, but one does not need to be tall and slim to have style (and styled garments). – is there any advantage a having the MtM suit cut by hand,? – is there any advantage for a hand attached collar when the suit isn’t bespoke? – where are their suits made? I’m surprised that you are not interested in where the items are made in Italy as, I would imagine, it is part of the back story of the brand as quality is purportedly being promoted. To be clear it seems that with Saman Amel you are concentrating on a MTM offering that also delivers style that is current (i.e. fashion). Therefore Tom Ford, Zegna, Hackett etc. should also be worthy of investigation. There are many offerings across England available for modest bespoke budgets; English Tailoring bespoke from £1,440 (+VAT), 40 Savile Row bespoke for £1,400, Michelsberg bespoke for £800, Goldings bespoke for £1,400, Harris and Howard bespoke for £750, Robert Tracey bespoke from £595 and Rodney Cundle. You also point to issues around MTM (pop ups etc.) but Gieves, Dunhill, Zegna, Hackett, Chester Barrie (£1,000), Robero Revilla, Dress2Kill, King and Allen, Reiss, Moss, Cad, Suit Supply, Edward Sexton, Threadneedleman etc. have all been in business for years. Other MTM offerings such as Aspley, Edit, Clement and Church, Beggars Run, Volpe, Birkett Bespoke, Marc Wallace, Jasper Littman, Cotswold Tailor are newer but have endured in a competitive market. Quality needs discovery, but it should be clear that between the cheap high street offering and SR bespoke there are many, many offerings out there. As I have said elsewhere, it is generally a mistake to look to the factory to establish what the quality level is. It can be a rough indicator, but nothing more. And this is particularly true with tailoring, where so much of the quality can be seen from the finished garment. On the design/MTM point, I agree and I’d certainly consider Hackett, Zegna, Tom Ford etc as you say. For different reasons the styles don’t appeal as much, but they should be considered on the same grounds. On bespoke, from what I hear some of those options you mention are not actual bespoke, but I can’t speak with any personal familiarity. As to the MTM options at the end, some of those are not constant at all. Sexton’s MTM is new, for example, and Gieves have changed their MTM offerings and factory in recent years (as indeed they have the quality level of their MTM, a few times – Mauritius to England to Italy). Overall, absolutely there are many options out there. I do try to cover as many as I can, with as personal an involvement as I can. Funny, their polo shirts are exactly the same from ones I own from Brio’s Beijing. Incredible pieces, yet probably from the same italian tailor? No criticism at all Simon, indeed I can’t think of anyone else that promotes the subject so well. It is simply that as the high street suit reduces in both choice and quality the various offerings off the high street need greater publicity – this of course is their responsibility. 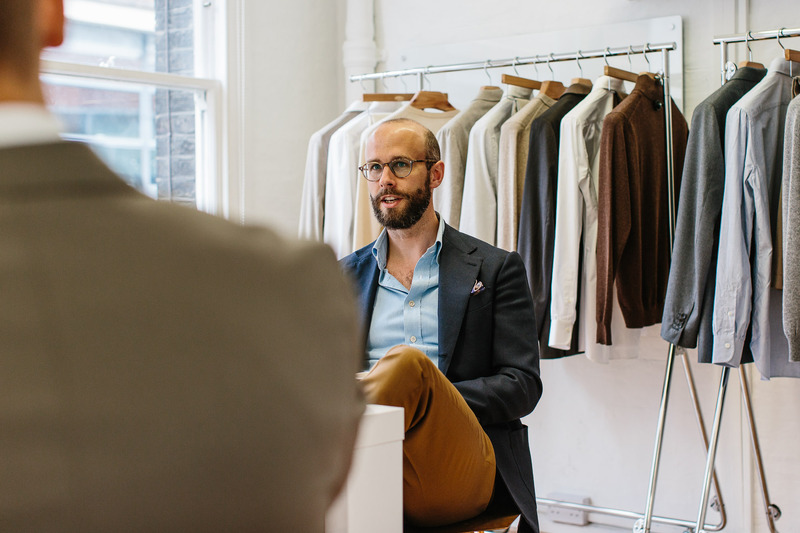 It almost requires an event or week, as with LFW, to push British tailoring, show the local choices and the value. This is particularly true for younger buyers seeking quality but whose own experience is restricted to what they have seen in fast fashion. Very interesting. In light of the recent article on P Johnson MTM, I feel it’s only pertinent to note that Samanamel obviously use Munro for their suiting production. It’s evident from their house cut (see the cut and line of the lapel on their Napoli line on their instagram) and the prices and various ‘lines’ also support this inference. The sole reason I’d like to point this out is to highlight the bias of many people who gave their two cents on the origin of P Johnson suiting. Now I don’t want to flog a dead horse, and I do believe, Simon, that your article on P Johnson was fair, however I believe that there were some ‘trolls’ taking advantage of the article as a soapbox for their views on the Australian company. I have no idea of the basis for their distaste towards the brand but their agendas seem quite clear: to undermine its reputation. In that vein, it’s interesting to see no one has commented similarly on these guys. On another note, I do love their stuff and I do not mean to take away from what they are doing at all. Thanks. I agree, certain people did rather take over the debate on that P Johnson post – although I tried to rein in the worst of it. Always a tricky balance between allowing free discussion and not have things become controlled by one particular agenda. I have confirmed everything as regards Saman Amel’s production, and have set it out below. I should say it’s another good example of why looking just at the manufacturer, or any name in that chain of production, is often misleading. Also, the lapel on my PJ jacket and what I have seen on SA are rather different from each other. The former is narrower and curves in far more towards the top. – Saman Amel have used various different producers and locations over the lifetime of the brand, as the majority of brands have. – The Napoli line was the first to launch and SA found an Italian workshop to make it for them. It is still made there. – When they wanted a cheaper line, now called Toscana, they contacted a Chinese manufacturer who asked them to go through Munro, as their European agent. They did, made in China briefly, but now make that line also in Italy – in a separate facility to the Napoli line. – Recently they have started using Munro’s system for digital mapping of measurements, keeping track of orders, and of stock – for both lines. This is a nice system that Saman and Dag rate highly. – However, all communication on both lines is with the two Italian facilities. They don’t talk to Munro, unless something goes wrong with one of those systems. – The designs and patterns for both lines were also created by Saman and Dag, with the help of their Swedish tailor. This is the biggest point of difference to many others that use Munro – it has standard patterns and designs that clients can use, which it then helps manage with the facilities. Hence the familiar lapel. SA does not use those. As you can see, the question of whether someone uses or doesn’t use Munro is not simple – and perhaps not helpful. There are many different types and levels of service, from software to agent to full manufacture and design. Frankly, as I’ve said before I don’t think any of this matters. What matters is quality, and that is easy to see from finished garments. If you care where something is made, all SA is now made in Italy. I do care about honesty, and Saman and Dag are very open about all this. What matters is the end product indeed. But where the product is made has an impact on costs, hopefully on prices. So whenever Asian and Eastern european countries do make quality, it is worth highlighting and should help convince the majority of us that Made in Italy is not mandatory. That is why I asked before what it was produced. In this case Italy, ok.
By the way, I have not understood why italy and France were struggling to train young tailors while in I guess equally high wage countries such as Japan and England recruitment is not an issue it seems. The readers here don’t have an issue with Sam Anamel and Munro, the issue people have with P Johnson is that he has built a company around lies and dishonesty and his success is arguably undeserved due to this. In numerous interviews in Australia he claimed to be a Savile Row trained tailor which is so far from the truth it’s not funny and then he claims all his products are made in Italy, which they are not. Sam Anamel has done none of those things and seems to be a very open and honest company. Why Made in Italy has such a strong trademark is unclear to me as well. I think it was some PR thing that the Italian government pulled after WW2 to get export going. Simon, anything you know something about? Not much, only that Italy has had probably the strongest menswear manufacturing industry since the 1950s. It has certainly had some government support, helped by a relatively poor south with undeveloped industry. Oh, and the law that allows you to say ‘Made in Italy’ even if you just put the label on there. That helps. That Italy influences fashion production is no surprise. Along with London, Paris, and NY Milan is one of the main cities that directs world fashion. It is home to many of the main fashion brands. However the difference is that there are many fashion businesses based outside of Milan (Florence – Ferragamo, Vincenza – Diesel, Rome – Valentino, Umbria – Cuccinelli etc.). This is unusual compared to other centres such as London wherein the industry is more centrally located. Beyond the brands are the manufacturing centres. However if one considers an example such as Prato which has 4,000 Chinese owned factories the industry is changing. As you point out Simon, there is also the issue of backended production, mostly supplied by the Chinese (the standards of which are now very high). I understand your argument about factory supply Simon, however the practice of brand quality control and finishing (maintaining brand reputation) is a subject worthy of further investigation. When can we expect a follow up piece on this? My curiousity was indeed raised when I saw a picture on your instagram stories. Awaiting the next trunk show for another fitting? No, actually in Stockholm at the moment and picked up the final jacket. Review coming soon! Enjoy your stay, sorry we couldn’t offer you better weather. But then I guess you’re used to grey skies and a bit of rain this time of year. It was nice running into you at Skoaktiebolaget! Hope the fitting at Saman Amel went well. Months on how have you found the usability of the Ettore jacket you had commission – from an enjoyment/fit based on the work performed perspective – is it one that you go to or is it at the back of your wardrobe. Would be interesting to hear your later thoughts on it now. I do use it a lot, just because it’s such a useful colour and material. The fitting is also very good – no padding, yet a perfect line through the shoulders. The only problem is it’s probably still a little too short, which bugs me. I’d be tempted to try him again and get the length right.